"'What are your Wow moments in ministry?'" I heard this question posed recently at a retreat but unfortuately I cannot recall who said it. However, the question started my mind rolling. Just when have I said "wow" to things taking place in our ministry? I decided that I would explore this question and asked a couple of fellow ministers wives to share one of their moments. Sometimes the "wow" ends with an exclamation point. You know those times. It is when you say, "Oh wow!" It is like me walking into chocolate factory and being told I could eat it all and not gain a pound. "Wow!" On a more serious note, it is those times when you are totally blown away with what God is doing or how is He is using others. One sister shared her "Wow!" moment with me on how God poured out His blessing and love on her family when they were going through the adoption process. Being the student minister, the students chose their son's name. Their church family walked through the adoption process with them by showering them with not only money and gifts but with their prayers, love, and time. When the adoption was secured and they were able to bring home their precious son, church members traveled approximately two hours to the meet them at the airport. What is a true "Wow!" moment when God shows His love so strongly to His called by actively using mere humans to be His hands and feet to provide their support during an often difficult and emotional process like adoption. Sometimes the "wow" is simply uttered with a sigh or a sound of disbelief. It is those times when you find yourself disappointed or just shocked at Christians in general. My "wow" moment is like a sigh. I sometimes am just confused at how casual Christians can be. Having married at the ages of 19 and 20, my husband and I have been in ministry now 33 years. We have seen some awesome movements of God during this time. However, we have also seen Christians pull away from the church. They either feel they do not need a church family to support and encourage them or they just do not want to feel "preached at," "ask to volunteer their time," or "support the kingdom of God through their tithes and offerings." I am discovering that our society today will accept any belief and what is more shocking many "born-again" Christians feel that there may be many paths to God. All I can utter is a sigh of "wow." I can only pray that God will reveal the truth to our world before it is too late. So sisters, what are some of your "Wow" moments in ministry? Do your "Wow" moments end in a period or exclamation point? Do they come with a shout or sigh or from amazement or shock? Let me hear from you. Philippians 4:8 has long been a favorite passage of mine. I have memorized it and have it on a plaque in my kitchen. God has used this particular Bible verse in my life during times of stress and worry. He has truly used in to change the way I approach difficult circumstances in my life. "Finally, brethren, whatever things are true, whatever things are noble, whatever things are just, whatever things are pure, whatever things are lovely, whatever things are of good report, if there is any virtue and if there is anything praiseworthy - meditate of these things." It was 2:00 AM and I was awake. I replayed all the solutions to the problem my oldest son was experiencing over and over in my head. I called out to God, begged, pleaded, gave suggestions and worried. He is a Godly young man, seeking God's will, surely God will remove these circumstances. I remind God that He is suppose to love Mark more than me and if I could, I would remove this unfair treatment from life. Does this sound familiar? I know the verses, "Trust in the Lord," "Be anxious for nothing," "The victory is mine, says, the Lord." I am quoting them, claiming them, why am I still awake, still worrying, still without peace? God took me to Philippians and began to teach me how to think. A change of mind. The mind of Christ replacing the mind of flesh. Listening to the right voice and not the voice of my enemy. He began to show me what was true (His plan is best). He began to remind me that He is just and this situation was not unfair, but part of His plan. He began to show me His pure motives and line them up against my 'motherly motives.' He reminded me that He is the Only One Who is Praiseworthy! I began to praise and sleep came. God's Word never returns void! I recently came across an old Bible study which gave some very simple steps to seeking God first. The following suggestions are very familiar, but I believe it is always good to be reminded. Sometimes the excuses we give for not seeking are given because we are believing the deceiver instead of the Savior. Jesus clearly tells us in Matthew 11:30 "My yoke is easy and My burden is light." Let me give you these simple steps to help you keep those priorities in the right order. 1. Practice His Presence. Jesus tells us in John 15 to "abide in Him." He knows that we need Him in order to go through our day and accomplish His Kingdom purposes. David says in Psalm 16:8 "I have set the Lord continually before me; because He is at my right hand, I will not be shaken." Continually wait on God for your words and your actions. He has a plan and is waiting to give us His instructions. 2. Guard Your Quiet Time. Jesus was our example for getting alone with God. In the gospels we are told repeatedly that He sent the multitudes away and prayed. We are told He rose a long while before day light to spend time with the Father. If our Savior needed that time everyday, you and I cannot take a step without it. We all have the same amount of time everyday. If we are seek God first, we will spend time in His Word and in prayer and in His presence every day. 3. Seek God in some extended sessions. I know this sounds impossible with the many meetings, obiligations and family things we each take care of. The thing is, Jesus spent and entire night in prayer - He is our example and we are to follow His example. If the Son of God needed that time to carry out the kingdom's work, how much more urgent is it for us to do the same? Look at your schedule and put in a place for extended quiet time and study. This may be once a month or even once a quarter. I believe once you make this a priority you will wonder how you ever made it without this time. 4. Stay Active in Your Body of Believers. This sounds crazy for a minister's wife, doesn't it? Yet, too often we sit and observe the show instead of jumping in and loving and growing with the believers God has put around us. Take the risk of truly involving yourself with the women in your church. Learn to enter the sanctuary to truly worship our God. Ask God to prepare your heart each and every time you go to church. These are not deep truths, but they are truths. Try it. Look and see where God has slipped in your priorities and allow Him back into His rightful place. Seek God First and watch Him work! I just returned from West Virginia speaking to a wonderful group of ladies. We studied "Rest." In the course of the study I shared with them that the first and most important way for us to enter into God's rest was that we must "Seek Him First." That sounds simple, doesn't it? Matthew 6:33 "Seek first His kingdom and His righteousness, and all these (other) things will be added to you." We will truly be unable to rest is we do not allow Jesus to be first in our lives each and every day. He has to be at the very top of the list every morning. As we learn this principle we will begin to see the rest of our day flow out of seeking Him. As women we have many distractions. There are many people in our lives, places we need to be and responsibilities to fill. This would be a great excuse to put God on hold, yet it is the very reason He needs to be first! Matthew 11:30 "My yoke is easy and My burden is light." Jesus assures us that it is not too difficult to put Him first. In fact, it makes things easier. Do not be deceived! When you and I stand before the Father, He is not going to allow us to excuse our time without Him on an unhelpful husband, challenging children or complaining church members. No one or nothing should be allowed to keep you and I from putting God first. Satan will tell you to wait, things will get better, but I am telling you that only God can make things better. Spend time with Him before you plan a single step and watch Him multiply your time, efforts, energy and love for those around you. Every year around this same time, I have to keep reminding myself of why I went into education. The end of the year is very hectic. I have less than a week left of school and then will be home until the first of August…..so maybe the hectic end-of-school is worth it. Now…the wedding planning begins. I am very blessed because my future daughter-in-law and her mother have so graciously chosen to include me in the planning. We have an appointment next week to go shopping. I am so excited. We have a little over seven months before the wedding, but Melanie is free this summer only and once school starts back in the fall, she will be very busy and the holiday seasons will begin, so time will fly by. It is such a blessing to listen to Cody and Melanie make plans. I feel so blessed that they are planning for the future and for their marriage and not just planning for the wedding. It seems as if so many times the bride and groom plan for the wedding and forget about the marriage. The wedding is important and fun………but the marriage is what is lasting. When I got married, my dad told me that marriage is something that I would have to work at for the rest of my life if I wanted it to be successful. Oh, how truthful. A successful marriage takes lots of dedication and work, but the rewards are a blessing. Since Granddaddy is not here to share that with my children, I have passed it on to both of them. While planning Cody and Melanie’s wedding, I keep remembering not long ago when we were planning for our daughter’s wedding. Wow, time flies! 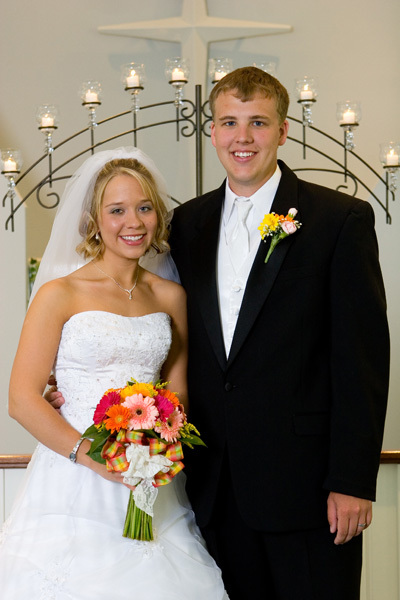 On May 26th, Kacie and Chase will celebrate their 4th anniversary. Happy 4th Anniversary and may you have many, many more. They are pictured in the photo above. My prayer is that in the mist of planning each couple will prepare as much time planning their marriage as their wedding. Weddings are just a unique as the individuals involved. I love how the personalities of the bride and groom come out in the weddings. Kacie and Chase had a traditional wedding, but their reception was at the lake and they drove away in a bass boat. Cody and Melanie are still working on some unique touches for their wedding. I’ve been to a wedding where the groomsmen walked down the aisle wearing sunglasses to “Bad to the Bone”. One wedding looked very traditional until you looked at their feet and everyone, including the bride had on converse tennis shoes in a rainbow of colors. One wedding, the bride had on a traditional dress AND cowboy boots and road up on a four-wheeler. What are some of the unique things you have witnessed at weddings? One of our teachers did not get her re-hire letter last week and has been very depressed. I have been talking to her and keep reminding her that God is Still in Control. He sees the Big Picture while we can only see the little picture. Many times in my own life I THOUGHT I knew what was best for me and God sent me on a detour….later I realized that He was just looking out for my best interest. I was once promised a teaching job just a couple of miles from my house and when the time came, I did not get the job. I was devastated. I could not imagine WHY God had let me down. Out of the clear blue, I got a call from another school twenty minutes away. I went for the interview and got the job. It did not take me very long to realize that I was EXACTLY where God wanted me to be. At the second school, I was much happier than I ever dreamed I could have been even at the first school. He saw the big picture when I was focused on the little picture. IF God had NOT closed the door on the first job, I would not have even given the second school a chance……….and in the end, that was EXACTLY where God wanted me. Let’s remember to give it all to God and let him guide us. He knows what is best for us. You are never happier than when you are in God’s Perfect Will. Tara…I kept meaning to post to your post last week and never slowed down. When I finally decided to take the time, I realized that it would probably be too long to post (since I tend to give the nine month version) so decided I would save it for this week. Sorry....but at least you know I read yours. Smile. God has used both of my children to “teach me valuable lessons”. One example that really stands out is when my Dad passed away sixteen years ago. His birthday was October 20th; he passed away October 24th and my birthday was October 27th. He had polycystic kidneys and had been on dialysis for 20 ½ years. After the funeral, we were helping my mom clean things out, etc. and Roger and I made a trip to town to Goodwill to leave a load and stopped by Wal-mart to pick up a prescription. While I was waiting in line, Roger went and picked up two birthday cards because it was my birthday, even though I had not remembered. We go back to my mom’s and Roger signs and give me his card and says, “I’m sorry I have not had a chance to get you a present this year…” I busted out crying and told him I did not want a birthday present…….it was the worst birthday of my life. WOW….what a lesson to be learned. Here I was being selfish and on a “pity party” and God used my 9 year old daughter to teach me a valuable lesson. My dad had suffered a very long time and was confined to a wheel chair. At the moment God took his hand, my Dad was no longer in pain and was running the streets of gold on two legs. “Out of the mouth of babes.” Don’t get me wrong….I missed my dad, and I still miss him, BUT he had been awarded the Ultimate Reward……he was living in eternity with Our Lord. And I have the assurance of knowing that one day I will see him again. I could go on and on about the different times God has used Kacie or Cody to teach me lessons. I am sure all of you have many lessons you have been taught also. We would love to hear them…. Matthew 7:1 “Judge not that ye be not judged”. I am so thankful and proud to say that our church is a very loving and forgiving church, but not all churches are that way. Some churches do not want the “undesirables’ to come. They want to make sure that everyone is “clean and living right” before they join. They tend to forget about the “Woman at the Well”. Also, many Christians like to put degrees on sin. Churches sometimes think they are in the “Judging Business” when in essence; we are in the “Healing Business”. God is the judge; we (or our church) is just the “hospital” to help love and heal the sinners. As pastor’s wives, let’s set examples for the other wives by loving folks and praying for them, without judging them. How do you personally handle “Judges”? A Lesson From My Tom Boy? I love how my eight year old GIRL is totally into these BOY things. God really made a unique little person when He created Riley. She chose pinkish purple paint for her walls, loves her new gemstone teal blue flip flops, and to wear her hair long. She isn't really that athletic, but is looking forward to trying out soccer in the fall. No, Riley is not your typical little girl, but I am not sure I would call her a tom boy either. All it took was getting stuck in the apple tree out back once, for her to swear off tree climbing forever. Riley is Riley, a wonderfully and fearfully made-by-God, growing little Christian. We were talking this morning of her Spiritual Birthday. It is such a blessing to watch her grow both physically and spiritually. As you can tell, both ways have been a real adventure. Riley does not fit most stereotypes for her age or gender. And, you know what? She is really alright with that. I am so thankful that God has made her content in her own skin. She knows her interests make her a little different and it does not bother her one little bit. Actually, she relishes it. She knows that is how God made her and that is enough for her. God, make me more like Riley. Keep me from seeking others' approval. Give me the confidence and the faith to just be the me you created me to be. Thank you for teaching me about myself through the faith of my eight year-old little girl. Continue to grow that faith Lord, and may she always find her identity in You. Thank you for Riley! As a mother, I now totally understand what Paul meant when he said women would be saved through child bearing. When I was still childless, I even resented that verse. Now, I can give daily examples of how God is using my children to draw me closer to Himself. One lesson that I am really savoring is how He has made each of us completely unique and how He loves each us just as we need to be loved. God blessed me with two girls. When the ultrasound tech told me Piper, daughter #2, was on her way, I truly doubted that the two would be THAT much different. Boy oh boy! Was I ever wrong! In the last two years, both of the girls have shown just how very different that they are. My older daughter, Riley, is very into Star Wars and video games. Piper, on the other hand, never leaves the house without at least one of her "pretties" - a bracelet or beaded necklace- and takes very careful care of all her doll babies. I am amazed that God twice took my DNA and their daddy's and came up with one blue-eyed, straight haired girl and one brown-eyed, curly haired girl. Don't we serve an amazingly creative God? Just as the girls like different things and look different ways, they also prefer to be loved in unique ways too. Piper loves to be cuddled and Riley loves to be verbally affirmed instead. They both keep me praying- for them, their daddy and myself. They both are part of God's larger plan, even now in their youth. God teaches me so much through them all the time! What are some things that God has used your children to teach you? Hello to all you mothers out there! Yes, I know yesterday was the big day, but I think our job as moms is so important that we can carry over the celebration into at least a second day. As ministers' wives we are faced with an added pressure if we have some people who call us mom, momma, mommy or mother. Our churches expect a lot of our parenting skills and of our kids. We are held by our congregations to a higher standard and our children are all too often judged too quickly. I have often heard our situation called a fish bowl. Everyone is watching how and when we discipline, not to mention how our kiddos respond. Many PKs have a tough reputation that, unfortunately, has been rightfully earned. So what do you do about it? How do you handle it? Please take a moment and write a line or two to encourage your sister. Remember Dear Mother, that you are not responsible to your congregation to raise your child a certain way, but to God alone! I do hope you had a very blessed, very special day yesterday. So, last post I mentioned that the enemy, satan, changes his strategy in his assault against us when we are right with God.....and one strategy he has in his arsenal is that tries to get us to “speak against” a brother. Another strategy he uses to keep us from having a close, intimate relationship with God is he tries to get us to become presumptuous. In James 4 it says our life is just a “vapor”. It is short. Fleeting. You know when you boil a pot of water on the stove and the steam rises just a short distance and then disappears? It does not keep on rising forever. That is how our lives are! Just like a vapor our lives will not go one forever. We are just a breath! Yet….we live our lives assuming we have lots and lots of time!! Not only do we presume that we will have tomorrow, we presume on the grace of God. If we are not careful, the security we have as believers will cause us to presume on the Holy Spirit and our salvation…then, subtly, without us even realizing it, we fall into the trap of having no sense of obligation or discipline or responsibility to spend time with God. We presume on His grace. This presumption then leads to disappointment because God is not handling things the way we think He should. Disappointment then leads to bitterness which leads to becoming critical. Do you see a pattern? Do you see how easily we can succumb to the traps of the enemy? We get close to God. And before we know it we have drifted into our former ways and we are no longer right with God!!! Beware my sisters. The enemy does NOT want us to be right with God! Guard against becoming critical and presuming on God!! Spend some time in James 4 and be encouraged!! I have been studying the book of James with some ladies for the past few months and am loving the powerful teaching that is coming from that book. James 4 talks about getting right with God by submitting to Him and THEN we can resist the devil and THEN we can draw near to God and He WILL draw near to us!! We are broken over our sin…we mourn and are miserable and as we humble ourselves in His presence the most amazing thing happens…He exalts us!! Wow! Here’s the thing though….we must be aware of the danger of getting right with God. Satan changes his strategy when we are right with God. He changes his focus from coercing us into obvious sins to getting us to withdraw our fellowship with God. This withdrawing from God can start with us becoming critical. James 4:11 tells us to not speak against one another. That word “speak” comes from the Greek word laleo which means “to make a noise”. This “noise” is the noise a wild animal would make!! It is the idea of making noise when no one is there to hear it. Can you just hear it now??? Whenever we are critical of someone we sound like a wild animal???!!! Simply making noise!! Be careful ladies….if you are right with God….be aware of the strategies of the enemy!! He can easily get us to focus on our “self-righteousness” and then become prideful which then leads to becoming critical of others. After all….we are in NO position to speak against anyone!! Most of us know how hurtful it is when others are critical of us or our husbands or children!! Let's focus on getting right with God and stop making noises like wild animals!! It is super easy to get distracted with ministry and serving and going and doing and taking care of our families that we find ourselves neglecting the most important relationship we have! God! Before we know it we have become impatient, critical, discouraged, dissatisfied or fearful. One of the first things we must do in order to be right with God is to be willing to surrender!! James 4:7 tells us to “Submit to God”…this simply means to arrange ourselves under His authority, His will, and His purposes. NOT a desire to serve God on our own terms but a desire to live according to His Word. We have two other authorities that are calling for us to “arrange ourselves” under. Pride and satan. James 3 says that “God is opposed to the proud” and James 4:7 goes on to tell us to “resist the devil”. “Resist” means to “draw the line”. It is an imperative. We have no choice. We must draw the line! We will either draw the line against God and choose our own will or we will draw the line against pride and the devil! Sweet ladies…I find this is super hard to do!! Submitting to God and resisting the devil….but I know it is a MUST if I am to be right with God. AND it is beautiful as we “arrange ourselves” under His authority we are under His umbrella of protection! I don’t know if you have had the rain where you are like we have….but I am daily in need of an umbrella to stay protected from the rain. Even more so are we in need of the Godly umbrella of protection as we remain under His authority! We would never think of running out from under an umbrella during a torrential rainstorm…why in the world do we run out from under His umbrella? ?